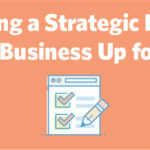 ﻿ Creating a Strategic Plan to Set Your Business Up for Success » Red Mango Marketing! As a business owner, you’re investing a lot in your business to help it grow and succeed. But is the direction you’re taking your business the right move? Have you thought about what you want your business to accomplish in the short and long term? Do you go through strategic planning on a regular basis? If you haven’t, you’re not alone. A 2018 survey by Constant Contact found 63% of the 1,005 small business owners surveyed in the U.S. only plan strategically for a year or less. A strategic plan is a tool that can help you make informed decisions and determine where you want your business to be in the future. The strategic planning process involves time and communication. Here’s how you can get started with creating a strategic plan for your business. Before you create the actual strategic plan document, you’ll have to form a committee. If you have employees, it’s a good idea to include them on the committee. Your employees can provide you with a different opinion during discussions and meetings. Try to aim to include employees from different areas in your business. Set up a regularly scheduled meeting with your committee for strategic planning. You can create an agenda to make sure discussions stay on topic and you accomplish the objectives for each meeting. One of the first things you want to accomplish is determining the timeframe of your strategic plan. Will it outline the business’s next three years? Five years? Ten years? This will tell you and your employees what you want accomplished in that time frame. It’s also a good way to gauge if your business is on track to meet objectives and goals. You’ll also want to hear from your employees about what they think the business’s strengths and weaknesses are. Although you may have a high-level overview of the business, your employees can provide a different view and opinion. They may shed light on issues you may not know about – for both the business and employee-related subjects. Or they may provide suggestions to make business operations more efficient. For example, you may think employee morale is high, but they may tell you there have been issues with employee benefits. This discussion could lead to the goal of hiring a human resources manager to take over questions and issues related to employee benefits, such as health insurance, retirement savings, or workers’ compensation reports. It’s important to encourage an open dialogue during the strategic planning meetings. The first few meetings should give you and your employees better insight on the business. As the strategic planning process progresses, you can ask your committee for feedback on goals and objectives, as well as potential changes to the plan. If you don’t have any employees, you can still go through the strategic planning process. Put aside some time each week to commit to thinking about your business strategy. This could be 30 minutes or an hour or two to think about your business’s goals and future. In addition to determining your strategic plan time frame, try to focus on what you believe your business’s strengths are. Note any weaknesses and try to develop ways to fix them. You’ll also want to focus on external contacts. You can talk with your customers and clients to get their perspective on your business. Explain to them what you’re trying to do and that you’d like their honest feedback about your business. You may not like everything you hear, but it’s important to note any weaknesses or complaints in the strategic planning process. A SWOT Analysis is a model you can use to examine your business. SWOT stands for Strengths, Weaknesses, Opportunities, and Threats. These four categories help you analyze your business and serve as discussion points for you and your employees. When you’re conducting a SWOT Analysis, being candid and honest is an important element to success. Done properly, a SWOT Analysis can help you and your employees develop goals and objectives for your business. After a few meetings and a SWOT Analysis, you should have enough information to start developing your strategic plan. You can purchase software or apps that are specifically created to help users create a strategic plan. These apps and software also help users monitor the strategic plan and any data entered. Creating your strategic plan with your own template is also an option. Short- and long-term goals and objectives: Your strategic plan should include goals and objectives you can achieve in the next year, as well as the long-term. This could include increasing sales in the next year and growing the number of new customers year over year. An example of a short-term goal could be to reduce return rates and a long-term goal could be to grow revenue by 5% in the next three years. Action plans: These supplement your goals and objectives. They outline steps your business will take to accomplish the goals and objectives. Scorecards: This helps you measure if your business is on track to accomplish the goals and objectives. It’s an accomplishment after creating your first strategic plan. But the process doesn’t stop there. Remember to regularly review your strategic plan to monitor your business’s status towards accomplishing the goals and objectives. And if it’s necessary, make updates to the document. Whether you use the help of an app or create your own template, having a strategic plan in place puts your business on a path to grow and succeed in the future. If you have employees, involve them in the strategic planning process. And if you’re running your business solo, you can still set aside some time to think about your business’s strategy and future. Conduct a SWOT Analysis to help you examine your business and identify areas of improvement and growth. Talk with your employees, staff, customers, and any external vendors you have a relationship with. The more information you gather, the easier it’ll be to create an in-depth strategic plan. After you’ve created your business’s strategic plan, don’t forget to review it regularly. Share updates with your team. And make the strategic plan a critical component to your business’s success. The post Creating a Strategic Plan to Set Your Business Up for Success appeared first on Constant Contact Blogs. This entry was posted on Wednesday, January 2nd, 2019 at 8:53 am	and is filed under Business Tips, Fresh Insights, News & Updates. You can follow any responses to this entry through the RSS 2.0 feed. Both comments and pings are currently closed.